"Our mission is to celebrate National Honey Month and Lithopolis Honeyfest Day in Ohio, experience the science and art of apiculture (beekeeping), and create a robust atmosphere of art, music, food, fun and people...We invite you to join us for a full day of live entertainment, finer quality arts, kids crafts in the Busy Beehive, photography contest, Honey Cook-Off and sale, bee beards, honey, honey tasting, honey extraction, beekeepers, hive products, observation hives, educational displays, and delicious honey made food." To commemorate the event, every year a Honeyfest cookbook is made containing all sorts of scrumptious recipes that use honey - and your favorite honey recipe can be included, too! If you want to join me in submitting a honey recipe for the Lithopolis Honeyfest cookbook, just go to the event website: http://www.lithopolishoneyfest.com/, click on "Cookbook" at the top of the page, and remember to order one for yourself! Have fun cooking with honey! According to the U.S. Department of Agriculture, insects pollinate 1/3 of the food we eat, and honey bees pollinate 80% of that. So, nearly every third bite you eat comes to you because of the honey bees’ hard work. But wait a minute…what is pollination, anyway? When these plants bloom, the farmer knows that they are ready to be pollinated so they can produce fruit and seeds. Because there are so many plants blooming at the same time in that field, honey bees must be brought to the field to do the job. But who will bring the bees and how will they get there? Beekeepers are people who keep beehives. Some beekeepers have only a few hives that stay in the same place, but other beekeepers have many hives which they move around the country to pollinate plants. When the flowers in the farmers’ fields begin to bloom in the spring, these beekeepers stack their hives onto semi-trucks, strap them down for the ride, and then drive them to the farmer’s field. The farmer pays the beekeepers, renting the number of hives his crop will need to be well-pollinated, and then the beekeepers set their hives in the field or orchard. The bees remain there until they have pollinated the crop (that’s a lot of flowers! ), and then the beekeepers load the hives onto the truck again to drive to the next field in need of pollination. Meanwhile, the flowers in the first field can produce fruit and seeds which the farmer can harvest and ship to the restaurants and grocery stores where we can find them! So this is how the honey bees and the beekeepers who keep them bring us nearly 1/3 of our food! Watch Pollen Nation by Singeli Agnew and Joshua Fisher (http://www.pollennationthemovie.com/) for a a great video on the importance of honey bee pollination. 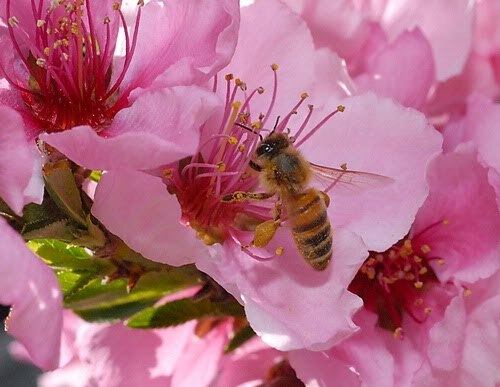 “Bee in the Know”: Honey bees pollinate more than 90 different crops in the United States.